I came into this story already expecting that I would not to enjoy it as much as its predecessor, The Fire Lord’s Lover, and unfortunately it didn’t exceed my expectations. 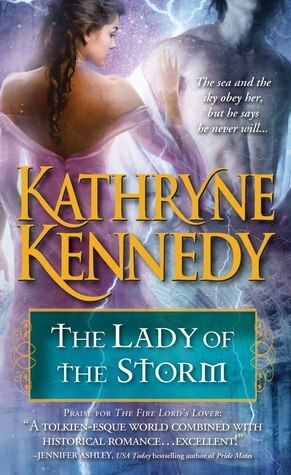 Kathryne Kennedy’s Lady of the Storm has all of the pieces, but I was honestly left wanting to simply go read The Fire Lord’s Lover all over again. We have a new hero and heroine in this tale, both elf/human half-breeds. The story centers around Cecily, who we meet as a child in the first book, and Giles, her sworn protector. In the first book we learn that Cecily inherited exceptional power from her Imperial Lord Elven father of Dewhame to control water and weather elements. This made her a target, so she had to flee into hiding in order to remain safe. At the start of this book we see that she’s managed to live in secrecy for about ten years until the Imperial Lord’s soldiers show up at her door. She is forced to go on the run again, but there’s no more running away. It’s her time to fight back with Giles at her side. I felt like this book had more love scenes than the first one and it took a lot longer to get to that point, so it was a bit condensed. 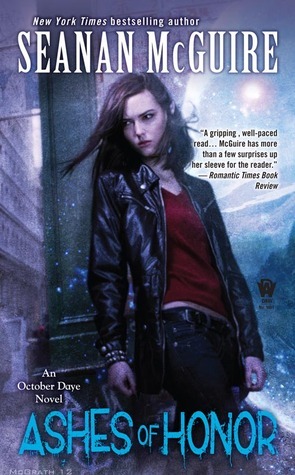 Also, whereas I liked the magical love scene in the first book, this one wasn’t nearly as interesting, though the author tried to be creative and original. I think this series would have benefited from focusing on Dominic and Cassandra instead of shifting to new characters. Dominic and Cassandra do make appearances a few times in this installment, but it only served to make me wish the POV would switch to them every time. There’s nothing particularly likable about Giles or Cecily. I didn’t feel a lot of personality with them like I did with their book 1 counterparts. They are heavy on the angst and emotionally weak. I was also disappointed with the lack of development for her Imperial Lord father as opposed to the first book. I like for the villains to be well-developed. The final showdown was really anti-climatic and I wasn’t invested in it at all; it only sealed this book’s fate as forgettable. I just wanted it over so that I could skip to the preview for the next book. I hope that the author rebounds, but I won’t be quick to read this next one, which sounds like it could potentially be the last one. I haven’t heard one way or another as to whether this series will be a trilogy, but if she can’t turn things around then the sooner she ends it, the better. Fire Lord’s Lover (The Elven Lords #1) – I’m on a roll! 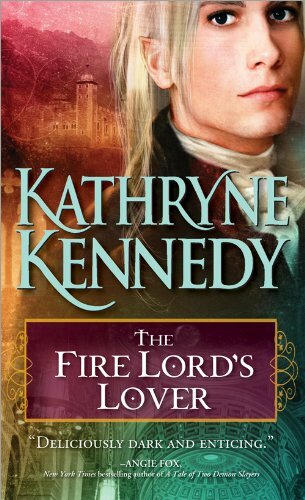 The Fire Lord’s Lover by Kathryne Kennedy is yet another FABULOUS ebook cheapie at $1.99! This was on my to-be-read (tbr) list for the longest, so I was really glad to finally get around to it. It was so good that I read it in one day…and then I read it again!! Yep, I read it TWICE! 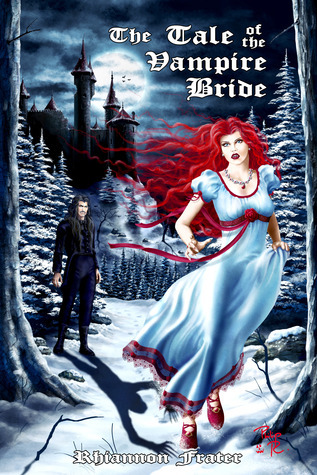 In an alternate universe during the middle ages, England endures the reign of Elven Lords—powerful and magical beings from Elfhame who entered the human realm seeking war and even more power. Unable to return home, they decided to make themselves comfortable in the human world, acquiring slaves and servants to maintain their palaces and lands. While stunningly beautiful, these humanoid creatures are evil and self-serving—mating with humans solely to produce formidable champion warriors. Most English citizens comply out of fear; however there is the Rebellion, a large number of people secretly working together to put an end to their tyranny. Lady Cassandra is one of them. She is a secret assassin raised to be the wife of General Dominic Raikes, the champion son of Imperial Elven Lord Mor’ded. They are to produce a new champion for Mor’ded, giving her a perfect opportunity to infiltrate his court and assassinate him. On the flip side, Dominic works hard to conceal his growing power from his father. Of course nothing goes as planned for neither Cassandra nor Dominic as they try to fight their growing feelings for one another. But they soon learn that Mor’ded is way too ruthless and powerful for either of them to take down alone. 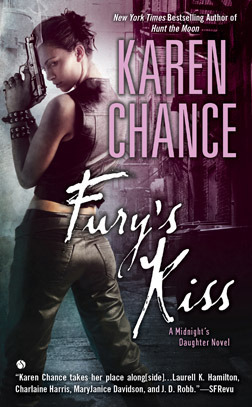 I have totally fallen in love with Ms. Kennedy’s world and her characters. Next to vampires, elves and fae are a not too distant second as my favorite supernatural species. I love love LOVE her imagery! I truly looked forward to any scene where magic was involved because she makes it very intriguing and fun. I adored Dominic and Cassandra and their evolving relationship over the course of the book. While it follows a similar pattern of other romances, it doesn’t feel cliche so I really invested in this part of the story. It’s really fresh…or as fresh as you can expect for a historical setting. I’ve read many a love scene in my large library of books, but this novel contains a scene that is probably up there with my all-time favorites. It’s super tasteful, magical, and well-placed while remaining really hott. I never tired of any of the characters or the story which is a testament to Ms. Kennedy’s writing ability. It’s just the right length, so the story doesn’t drag. Usually towards the middle of a book I will get bored, but for this book the middle is my favorite part, keeping me the most engaged. I’m a little concerned about the mixed reviews for the second book, but I will give it a chance. It is an ongoing series. I’m super disappointed that the next book won’t center on Dominic and Cassandra, but I will give it a chance because the world building is as good as it gets. 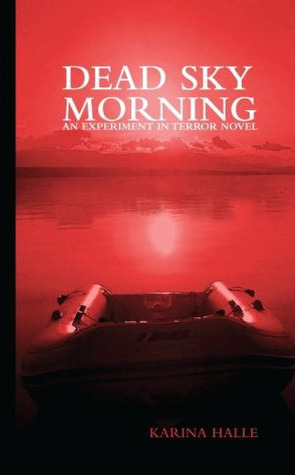 Another one that I highly recommend, and for $1.99 you have nothing to lose, or a least not a lot.